Hovenia dulcis (Japanese Raisin Tree) is a source of dihydromyricetin (Ampelopsin) and has traditionally been used as an anti-alcohol herb and hangover cure. At least one human study has noted that, when taken before drinking, it can reduce circulating levels of alcohol. Our evidence-based analysis on hovenia dulcis features 14 unique references to scientific papers. This page features 14 references. All factual claims are followed by specifically-applicable references. Click here to see the full set of references for this page. These are estimated human doses based on rat studies, and it is uncertain if they are the optimal dosage or not. Hovenia dulcis is a Traditional Chinese Medicine for hangovers that is distributed naturally in the areas surrounding China, Japan, Korea, and the Himilayas; it is also known as Japanese Raisin Tree. It belongs to the genus Hovenia of the family Rhamnaceae and is one of three species of Hovenia, the other two being acerba and trichocarpa. This particular species, dulcis, has two variants known as tomentella and koreana. Both variants of dulcis and acerba have been used as medicinal plants. Medicially, the part of the Hovenia Dulcis plant that is used is either the fruit or the peduncles (stem of which holds the flowers), and the peduncles have been reported to have a taste similar to a combination of raisin, clove, cinnamon and sugar. Hovenia peduncles can be pressed into fruit juice, or fermented into wine or vinegar and appears to retain similar properties. The main active ingredient is usually touted to be Dihydromyricetin, although Hovenitin I appears to have similar anti-alcohol effects. When administered to rats, a water extract of the fruits and seeds of Hovenia at 487.8+/-14mg/kg bodyweight with alcohol at 3g/kg bodyweight was able to reduce circulating alcohol levels when administered either 30 minutes before, 30 minutes after, or simultaneously; it showed most efficacy when taken 30 minutes prior. 2 hours after ingestion of alcohol, the levels of alcohol in control (ethanol only) reached 29nM whereas Hovenia pre-load reduced it to 5nM and simultaneous intake to 13nM. These blood lowering effects have been replicated in rats (reaching suppressions of 40% alcohol and 37% acetaldehyde) and in man, where an ethanolic extract of Hovenia (0.125g/kg) 20 minutes prior to alcohol at 0.3g/kg was able to reduce levels of alcohol and acetaldehyde in the saliva and reduce breath alcohol from 1.72 mg/L-1 to 0.24mg/L-2, or to 14% of control levels. When paired in rats, Hovenia did not appear to significantly influence measured liver enzymes in rats (GOT, GPT) in either a beneifical (reducing) nor exacerbating manner. Ethanol is metabolized to its first metabolite (acetaldehyde) via the ADH enzyme, which is further converted to acetic acid by the ALDH enzyme. Both of these enzymes are decreased after oral ingestion of alcohol, and Hovenia was also able to attenuate the decrease in both ADH and ALDH activity seen with alcohol only when Hovenia was taken 30 minutes prior to alcohol, but not with concurrent intake or 30 minutes after ethanol. In this study the fruits of Mori Albae as well as Alpiniae Katsumadai and Dolichorus seeds were able to attenuate the reductions of ADH and ALDH at all three time points. Hovenia dulcis appears to reduce circulating levels of alcohol in the blood when taken before drinking. This works somewhat when taken during or after alchohol consumption, but is most effective when taken 30 minutes prior to drinking. The methanolic extract of Hovenia appears to protect rat and mouse liver from injuries from CCl4 as well as a galactosamine/lipopolysaccharide mixture, two methods used to induce liver damage under experimental conditions; this may be due to the dihydomyricetin content. A later study investigating mechanisms of the Hovenia peduncle (stalk) noted that oral doses of the extract at 100, 350, and 600mg/kg was able to offer protection from alcohol in reducing the increase in liver enzymes (AST, ALT), with 100mg/kg significantly reducing levels but not to pre-drinking and both 350 and 600mg/kg reducing AST and ALT to levels not significantly different than control. The higher dose, 600mg/kg bodyweight, was not significantly different than the active control fo bifendate at 150mg/kg. This methanolic extract (concentrated dihydromyricetin) of Hovenia also showed anti-oxidative capacities as assessed by TBARS (lipid peroxidation) ferrous ion chelation (mineral chelating) and superoxide radical scavenging and a fermentation product of the penducles (about 4.4-5.8mg/kg total phenolics) administered 2 hours before ethanol daily for 6 weeks was able to prevent the formation of fatty liver and significntly reduced ALT, AST, and y-GT levels relative to the ethanol group (so that they were not significantly different than control). This study also noted a normalization of serum triglycerides and hepatic glutathione, superoxide dismutase, and catalse associated with Hovenia dulcis vinegar and water extracts although the levels of anti-oxidant enzymes were still lower than non-ethanol control, and histological examination of the liver suggested it was not complete protection but merely a degree of protective effects. Similar protective effects on liver enzymes and histology have been noted against acute ethanol overload in mice with 100, 350, and 600mg/kg bodyweight Hovenia extract. When tested in vitro, the saponins hovenidulcioside A1 and A2 (glycosides of hovenidulcioside A) appear to inhibit histamine release from rat mast cells (an anti-allergenic mechanism) with IC50 values of 29.2+/-2.9mM and 53.2+/-1.1mM (respectively, against Compound 48/80-induced release) and 10.1+/-3.4mM and 48.2+/-2.3mM. One animal study attempting to find toxicity failed to find any side-effects associated with oral doses up to 22g/kg bodyweight in mice, 36.6 times higher than the highest active dose tested. ^ A palynotaxonomic study of the Korean Rhamnaceae. 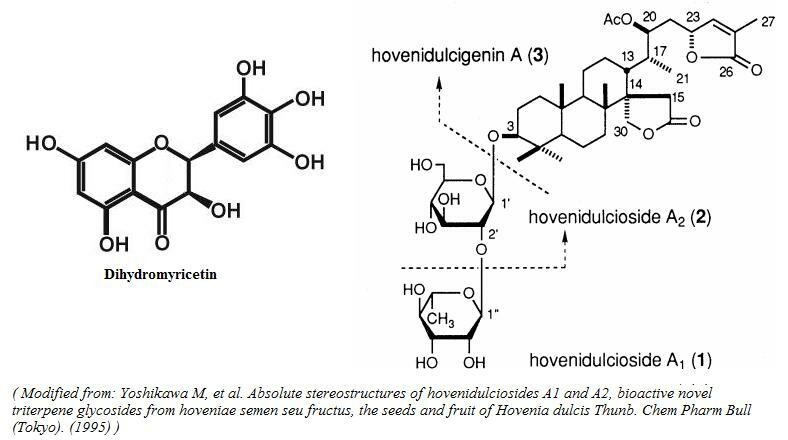 ^ Advances in Studies on Bioactivity of Hovenia dulcis. ^ Changes in Antioxidant Properties of Hovenia dulcis Thunb Vinegar during Fermentation Process. ^ a b c d e Effect of Water Extracts of Crude Drugs in Decreasing Blood Ethanol Concentrations in Rats. ^ Effect of extracts from Hovenia dulcis Thunb. alcohol concentration in rats and men administered alcohol.